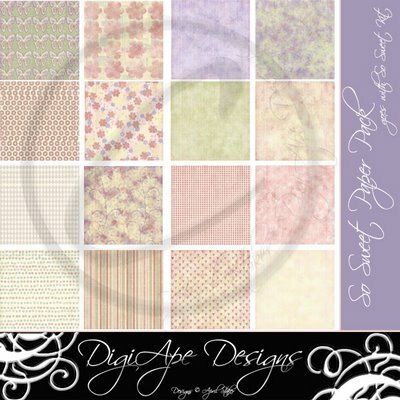 DigiApe Designs: So Sweet Paper Kit Free! I will be allowing you to download the entire So Sweet Paper Kit for free for one week! It will be available from 3/1 until 3/8! The kit includes 6 background papers and 10 patterned papers. They are all at 300dpi, and 12" x 12". Share the news! Send your friends here to get a free copy! Please don't share your copy- that would be against copyright laws. However, you can send your friends a link to my blog so they can get their own copy! Thank you!